News from Sergei Dobroserdov at Nakhimov Yachts that he’s signed a contract for the construction of a new 40m Impero hybrid-powered motor yacht at Admiral Teconar, part of the Italian Sea group. The first Admiral Tecnomar Impero 40m, Cacos V signalled a new direction for Admiral Tecnomar and was delivered to industry acclaim in July 2013. An innovative Siemens hybrid power system will enable the megayacht to cruise at 10 knots using just 60 litres of fuel per hour and she will have a transatlantic range. Using combined power with conventional diesel engines, she will have a maximum speed of 20 knots. In line with the owner's request for an efficient and whisper-quiet vessel, she will be fitted with variable speed generators. Exterior design is by Luca Dini with naval architecture by the yard's in-house team and the general arrangement is by Dobroserdov Design. Ten guests can be accommodated in five staterooms, and there is a large saloon with full height windows and a spacious sun deck, all decorated in a modern version of Art Deco. 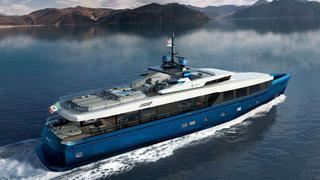 Nakhimov will supervise the construction and will offer the yacht for charter following delivery in December 2015.